In which I basically don’t define any terms and just assume you know what I’m talking about. Yeah, well, that was somethin’, wasn’t it? I think, in its defense, and in the short term, the Zero Hour reboot worked, as the twisted timelines/multiple Legions hoohar was resolved in an effective and not entirely unemotional manner during a DC Universe-wide event. And, unlike the usual shoehorning of the Legion into these events (difficult, given the Legion was set 1,000 years later than the rest of the DCU), it actually seemed to fit about as naturally as these things can. Now, the problem here is that a lot of the appeal of the Legion is its soap opera aspect, with decades of character development and relationships mixed in with the superhero action, creating a significant fanbase in the process. The Legionnaires whose lives you were following in, say, the 1980s were essentially the same Legionnaires that started to be introduced in Adventure Comics #247 (1958) and continued to pop up for many years following. There were the occasional reboot or retcon (the whole post-Crisis Superboy thing, the “Five Years Later” timejump) but you can still draw a line from the beginning of the Legion to, well, the end as represented by the Zero Hour tie-in. With that Zero Hour conclusion to the Legion saga as we knew it, the chain was broken. Granted, Legion fandom wasn’t what it once was by the time Zero Hour rolled around (what comic’s fandom was? ), but that was the final break between What Had Come Before and What DC Was Going to Try to Attempt in the Future. Even Crisis on Infinite Earths didn’t cut off the Legion’s progression, despite throwing some serious monkey wrenches into the works (like, as previously noted, the whole Superboy thing). For longtime Legion fans, that was a lot of investment in the characters that was seemingly just discarded by DC, but in DC’s defense, they couldn’t depend on just the longtime Legion fans to support the title. They had to pursue new readers and build the audience for this particular franchise, and usually the #1 strategy comic publishers go to when trying to bump up sales numbers is, well, new #1s. Or in this case, #0s, where as part of the Zero Hour event issue #0s were released in which the status quos of DC’s various titles were reestablished. And, in the case of the Legion titles, the adventures were rebooted…started from scratch and presenting a hopefully fresh, new jumping on point for readers previously intimidated by the decades of backstory. It worked, for a while anyway, and as I recall it sold reasonably well at least for our shop, gathering some new readers as hoped, and old Legion fans (like me) sticking around out of curiosity and, oh, because the comics were actually pretty good. This version of the Legion went through some interesting permutations, I thought, including the dark but still enjoyable Legion Lost mini-series, which followed the end of the previous Legion comics. There were a couple more series set in that Legion continuity, but eventually (and presumably sparked by a need to improve sales) a new Legion series was launched, rebooting from scratch again. It was a fun comic, I thought, with some new takes on old characters, but this reboot of the Legion only made it five years (versus the second reboot’s ten years), and then suddenly we were into our next rebooting of the Legion, which was actually more of a reinstalling of a back-up of the original Legion continuity into then-current DC continuity (with some minor tweaks here and there to jibe with the DCU as a whole). Following that was a mini-series connected to the Final Crisis event, in which all three (or three and a half, depending on how you feel about that last reboot-ish thing) versions of the Legion encounter each other, and I think it was around this point that I sorta lost the Legion thread. I love the Legion, I read ’em for years, and it was even the only extended DC Archives hardcover set that I collected. But after reboot and relaunch and wait we didn’t mean to reboot it again let’s go back to how it was before…I couldn’t do it any more. Like I said, one of the appealing aspects of the Legion was getting immersed in the soap-operatic nature of the stories, but the multiple reboots just gave me the feeling of “well, if they write themselves into a corner, they’ll just reboot instead of trying to write themselves out of it” and that sort of soured me on the books. I realize this is a complaint you can have about ANY comic that has a history of rebooting/restarting…I’m guessing DC’s New 52 relaunch hit a lot of people this way. But specifically with the Legion, with such a long history behind the title, to see what was special about it fragmented this way, was disappointing. The reboots seem to have shorter and shorter lives, with the New 52 version of the team (which I guess was still more or less the original continuity still, I guess?) lasting around a couple dozen issues. I’m hoping letting the team’s shelf presence rest a while (its first extended break that I can think of!) will help, and that whatever forthcoming relaunch may occur will be more well received. There are ideas I hope DC would attempt at refurbishing the Legion for current audiences. Maybe they could appear as supporting characters in another title, or perhaps a new title could launch focusing on just one member of the team (like Brainiac 5) with other Legionnaires appearing as needed. Or maybe the Legion can just say out of the public eye until someone has a really good idea how to use them…but with hints at their existence in the Supergirl TV series, I suspect any possible media presence may force DC’s hand sooner rather than later. So yes, DavidG, I think the Legion’s involvement in Zero Hour did cause the long-running franchise to stumble and never quite find its legs again. Not to say there weren’t good comics that came out of all the reboots, because there were, and that a five-year run of a series isn’t something to sneeze at. However, I’m not sure if or when the team will ever find any kind of extended traction again. Like Hawkman, the Legion was “fixed” until it was broken and…wait, that’s it! Hawkman and the Legion of Super-Heroes ! I did it! I fixed ’em both! DC, get on this right away! EDIT: Pal Andrew has additional wise insight on the matter. For what it’s worth, I’d been reading comics for 15 years and never picked up a Legion book before the Mark Waid reboot in 2004. I loved it so much I went back and started grabbing all the Adventure Comics and Legion books I could find from back to the beginning. It brought me in as a Legion fan and let me appreciate how far ahead those storylines were. Before the X-Men the Legion were doing these long relationship and continuity weaving storylines. It took the reboot to make me a fan. HAWKMAN AND THE LEGION OF SUPER-HEROES! Instead of trying to re-re-re-reboot the concept in the future, they instead prequel the concept in the days of Imperial Rome! During a sudden pitched battle on the outskirts of the Empire, an alien spaceship crashes and irradiates the area in the explosion. Suphis, the officer in charge of the Roman baggage train (literally the ‘carter,’ and the reincarnation of Khufu in that time period) rushes the support up to that sudden front to find the explosion has killed the main body of the legion and its rebelling-barbarian-coalition enemies alike. Likewise, the radiation blast has poisoned and is killing the women and children in the local villages…EXCEPT for those teenagers whose puberty genetics allows them to undergo startling changes instead! Suphis, without an army and far from any real Roman civilization, isn’t sure how to deal with this – especially when word arrives of radiated Super-Huns approaching from the East. The officer, his mind conditioned to such strangeness from vision of his lives from Khufu onwards, only has one possible idea to stop this menace to barbarian and Roman lives alike: he must train this scared adolescent in the use of their new powers and replace his lost legion with a new…teen-aged Legion of Super-Heroes! The Post-Zero Hour period is “my” Legion. I started picking them up when they showed up in the present and crossed over with the other DC books I was reading at the time (Flash and the Super-titles), and enjoyed the books so much, I went back and collected every back issue starting from the 0 issues forward, but I completely understand the feeling of loss for the continuity that you grew up enjoying, as that’s now the feeling I get from the New 52. I’m pretty much in agreement with Mike’s summary (so that’s an A for you young man). Perhaps more than Mike, I was annoyed by the reboot making them teenagers again though. For me the best Legion is the Levitz era stuff, (although it was the” 5 years after” that hooked me). Making them teenagers really felt like a regression, and pandering to old fans. But I agree that there were plenty of good stories, even post Zero Hour, at least for a few years. And Legion Lost was pretty good too. And the Waid reboot was often enjoyable. I even sort of liked the new Levitz era. Let’s face it, I’m a sucker, and will probably follow the next reboot too. For me, where the Legion went all wrong kind of falls inbetween where you and Andrew put it – the post-Giffen 5YL Legion, after the Earth is destroyed, is an absolutely godawful 2 year run of comics, despite some lovely Stuart Immomen and Chris Sprouse art (and a fantastic Fatal 5 arc that opened the Legionnaires series). Surely a total Year Zero reboot wasn’t the *only* way of getting out of the rut the title was in after Giffen jumped ship though, and in the end that hard reset did way more harm than good to the long-term prospects of the book. Shame. What if the Legion could capitalize on ALL those reboots by not just being a futuristic, superhero space army (or whatever they are) and instead be a MULTIVERSE superhero army. Their task would be the exploration and continuity/timeline maintenance of alternate realities. Got THREE Ferro Lads? HERE’S why. AND they’ll share an adventure. AND we’ll kill them all off in this time-jumping story, because there’s not supposed to BE a Ferro lad. Our maybe there IS, in another continuity. Sure, it could get messy. But I think that if they steer INTO the skid and embrace the multiple reboots (without getting too crazy with it), it might actually work. But, I’m just spit balling. This could be a horrible idea. Now, ask for a Doctor Strange fix and I’M your man. Funny I’m in the middle of a reread of the 1989 Legion series and it is so, so good. the Terra Mosaic is some of the best comic booking ever done. So yeah, agree 100% and the reboot forever soured me on Mark Waid. The fact he got to reboot the Legion into teens TWICE forever puzzles me. Especially since well, if he wanted teens all he had to was make some. “And then the Legionnaires decided to train the next generation of heroes…” No cosmic reboot, no time line mucking, just y’know writing. If anyone thinks I would ever have passed up a chance to write the pre-Zero Hour Legion, they are sorely mistaken. That was never an option, neither in 1994 nor in 2004. It was an option only for Geoff. Pardon me for sounding a little resentful that, 20+ years later, all I get as a freelancer is blame for a corporate decision. 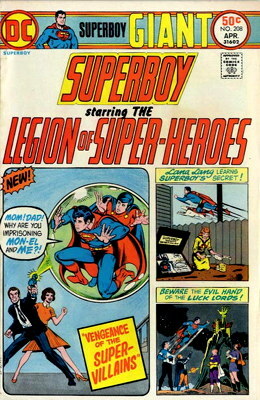 I’ve been on and off with the Legion since the days when it was drawn by Mike Grell. The Levitz/Giffen and Levitz/Lightle era. I really enjoyed the ‘Threeboot’ for a while, one of the few comics I bought as floppies and then immediately bought when the trade came out. Think I left the threeboot around the time Jim Shooter came back, but by that time it had turned into a more regular futuristic super-hero book. Mark – Well, a few of my respondents (and me!) thought you did a good job, regardless of the editorial decisions you were working with, so we’re not all blaming you! Just wanted to chime in and say that I got into the Legion post-Zero Hour when they crossed over with Superboy. And I also went back and bought a bunch of Levitz era comics. I felt that the post-Zero Hour started to loose steam when it acknowledged the previous timeline in issue #105, for some reason I just stopped reading at #111. I guess I wasn’t the only one because 11 issues later was the start of the DNA Coipel run. Anyway, I just wanted to join in the Legion fun for a bit. Mr Waid thanks for jumping in and I’m sorry if you feel you are treated unfairly but well… It’s your name on both the 1994 and 2004 reboots. It’s a shame the Legion had to endure so much editorial mucking. Paul Levitz had to deal with it in 1986, the Bierbaums and Giffin got hit again in 1989. But I loved both of their runs and they managed to keep going with minimal disruption, just an issue or two of house cleaning then back to the main show. The 1994, 2004 and 2009 reboots however basically told fans the characters and stories they loved were not worth remembering or building on BUT for some reason we should keep reading because these new reboots share the same name as the previous series. It’s a contradiction that broke the fanbase and the franchise.